Experience the incredible journey of faith and courage as nineteen-year-old Soonie Eckhart travels to an illegal Comanche and Kiowa settlement in North Texas to become a teacher for the children in hiding. Despite her Comanche roots, she finds many in the group, including a volatile young man named Lone Warrior, refuse to accept her. After a chance encounter in the hills with a band of dangerous men, Soonie must draw on the deepest parts of her faith and courage to survive. Clean, Christian series with a hint of Romance. This is a light-weight Christian novel, and was easy reading. Gave a good message. Soonie, who is a quarter Comanche, goes with her uncle to teach the children at a secret Comanche-Kiowa settlement, where Kiowa brave Lone Warrior helps protect and support the group. Best bits: Soonie is in a rough place between two cultures, but seems to navigate it well. I admire her interest in Comanche and Kiowa culture, along with her desire for her people to turn to God and her belief that all people are equal before God. I liked her frustration with the traveling preacher's attitude of white superiority, and wished she hadn't gotten repeatedly sidetracked from confronting him on it. I liked how she spotted Lone Warrior's subtle smiles of affection, and didn't let him get away with using peyote to "hear God." Lone Warrior certainly cares for his people, and becomes an even better protector, I'd say, when he lets go of his bitterness and anger and turns back to God. They are good for each other. God's love for everyone, regardless of race, culture, or past sins, is a big theme, and a good one. Soonie embodies this very well in her interactions with the people in the settlement and with saloon-girl Darla. Just a few typos. I appreciated the consistent POV. Issues: Though it is a HEA ending, I would've liked for the story to go on beyond the first leg of their journey together. The epilogue is hardly a satisfactory substitution for more of the story! Great story, excellent writer, wish story was longer. Hope Miss Angela will follow up with more on Soonie. a romance book that is clean. This was a lovely story of Soonie, the new young teacher who is part Comanche, and who was introduced in Castillo's THE RIVER GIRL'S SONG. 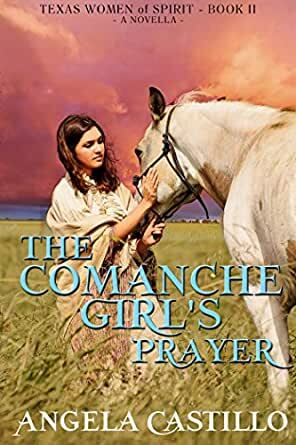 Her new situation in an illegal settlement of Comanches and Kiowas is rendered in gritty, heart-rending detail, and I love how determined and resourceful Soonie is, both in teaching the children, and in how she interacts with those in the settlement, the nearby fort, and the circuit preacher. There were a few places I wished the author had expanded the story into a full-length novel, it is that good, but even at its shorter length, the storyline is compelling, the characters believable, and the Comanche and Kiowa cultures treated with respect. I recommend this story to anyone interested in Texas history, Comanche and Kiowa culture, or just a good inspirational story with a dash of romance. Soonie was raise in Colorado with her brother where the name half breed meant nothing to their friends and family. As she grew older she felt the calling to return to her people and teach the children. They needed to be taught to read and enter act with the white man. Her mother and uncle had taught both children how to be Cheyenne and she knew she could handle the hardship of rejoining the renegade band her uncle co lead. This was a mixed band joined for survival facing more hardships than Soonie was prepared for, she had to draw on her faith many times to fined the next step in her story. Loved the story. Here again. Stayed up all night to finish. So am going to sleep now. A fourth Indian and three quarters Swedish. Soonie's uncle came for her when she received her teaching certificate. Her uncle was Comanche and living off the reservation. She lived with her grandmother and a cousin. This is Soonies story and the children she taught. The other Indians living off the reservation under the care of the soldiers at the fort became her family, some were Christian, some were not. Not a easy book to read but it was worth reading.